Best Hiking Vacation Ideas: What Are Your Options? The best hiking vacation is the one you talk about year after year once you're back home again. It probably had nothing to do with the weather, or the scenery. Of course hiking trips revolve around the weather and the scenery! Iconic hiking destinations will give you plenty of company, but also plenty of ways to get there. They aren't called classic hiking destinations for nothing! And guided hiking tours to these places are plentiful. Other hiking destinations which are remote, off the beaten path, or not discovered yet? It will be harder to find folks willing and able to take you there. In each category, we'll drill down to specific hiking and trekking vacation ideas you can try on for size and cost. Then you can go forth and hike on your next hiking vacation! If you have a hankering to hike in an accessible and spectacular hiking area, it's likely that other hikers share your enthusiasm. Booking a group hiking trip with a hiking tour company is as simple as doing an online search, narrowing down the offerings with the length and dates of trip you need, understanding the amenities or lack thereof, and booking the trip. To make the best possible choices for a group hiking trip, either in the United States or in another country, read this first. I share the good, the bad, and the frustrating about group outdoor trips. And a checklist to get the trip of your dreams (not nightmares). Then check out REI Co-op group hiking trips for an example of a company that does things right. REI Co-op understands how outdoorsy people think about their best hiking vacation destinations. Even better, you can select the activities you want on your hiking vacation. So if you want to branch out from hiking and trekking, you can include cycling, mountain biking, kayaking, or a mix of sports in your trip. Rock solid reputation, a deep understanding of what it takes to pull off the best hiking vacation (gear, food, safety, logistics, fun), and a willingness to tailor a trip to women only. places where a hiker could turn daydreams into reality. Check out their latest trips here. The thing about booking a trip through The Clymb is timing: you have to make up your mind fairly quickly if you want to snag the good pricing. Some trips are discounted an eye popping 58%. A hike in lodge allows you to earn your soft, warm bed with the sweat of your brow (and legs, and back) while offering you amenities you won't find in the bowels of your backpack. Home cooked, delicious meals prepared for you, for instance. Clean, soft towels and a shower every day, in most hike in lodges. To maximum your outdoor time and tailor it to your desires, knowledgeable guides and hosts will point you in exactly the right direction for your day hikes and explorations (and have contingency plans for rainy days). In North America, there are a handful of well known hike in lodges catering to hikers, detailed here. I've visited exactly none of them, so am not an expert on how to choose the best one for your vacation. In British Columbia, there are many different lodges perched in mountainous areas. Although some of them can be reached by long, sketchy hiking trails, it makes more sense to transport hikers and their gear via helicopters. Expensive helicopter fuel makes this type of hiking vacation costly compared to other types of hiking. You are confined to one basin, with its surrounding terrain, for 3 to 7 days of hiking. Super easy to find yourself at high elevation on Day 1, rested and ready to hike your legs off. Good food, a restful night's sleep, and no logistics to plan leaves you in great shape for the duration of the trip. Bonus upside: If when the weather turns snotty, you've got a warm, dry, cozy lodge with meals. Some lodges bake afternoon tea treats, too! I've stayed at several of these B.C. lodges, so if you'd like some recommendations based on what you know spells the best hiking vacation for you, I'd be happy to chat. What you're going for here is someone, or a company, who can listen to what's important to you as you design your best hiking vacation. And can pull it off for you! Some group hiking companies (see above) will customize a hiking trip according to your specifications. I've requested this for trips in Alaska, with excellent results. A big company with office staff, guides, and support people pays attention to marketing. They have to, to book out all of their yearly trips. So expect professionally produced brochures and ads to snag your attention. Gaze at this hiking eye candy, but do not succumb to the lure of the glossy photos and mouth watering descriptions of backcountry cuisine. Do these people look like folks I'd like to hang out with for days on end? Is this terrain intimidating to me, or too easy? Do the photos portray my interests: wildflowers, glaciers, wildlife, rivers? What are the nightly accommodations? What types of food will I be eating? Where do I have to travel to join this trip? A big company has standard operating procedures for running the trip, and that's a very good thing because it ensures your safety and satisfaction. However, if you want a customized hiking trip which deviates from the standard package, you will pay additional fees for your own guide, equipment, and transport. The more people you can guarantee for this custom trip, the lower the price. And there is always a minimum group size, usually 3 or more people - unless you want to go really custom (just one or two hikers). These nimble little companies can be family based, with deep ties to the local community. You can feel good about supporting a small local hiking tour company, because most of your money stays right there. These folks specialize in off the beaten path types of hiking vacations, so if you're craving some unique terrain, find a local operator who loves that area and can't wait to show it to you. They also have more flexibility than a large tour operator to cater to your time constraints and hiking whims . To begin planing your best hiking vacation with a small local operator, decide on a destination first. Then do an online search using that location plus "guided" or "tour". You will quickly narrow things down to someone who has been living and hiking in that area for years, and has some great hiking ideas in mind for you. It's important to be forthcoming with your preferences, constraints and requirements around food and lodging. Don't assume all of your questions and concerns can be addressed via email. One simple phone call will go a long, long way toward a good outcome for both of you. Hanging out with the locals is one of the smartest ways to get the best hiking advice and insider information for a particular area. If you're particularly polite and well behaved, they may even share their favorite hikes! Hiking nirvana!! This is the way we all started, back in the humble days of learning how to hike, backpack and base camp. Or maybe it's where you find yourself right now: craving more outdoor time and having some vacation days on the calendar. Pick the best hiking destination for your style of hiking. Get specific: Not Alaska, but the southeast region. Decide on the month of travel, and on the number of days/nights you can devote to your trip (important for snow levels, surface water accessibility, bugs, etc). Choose the type of accommodations you want: car camping, backpacking, cabin, motel, inn, lodge, bed and breakfast, or a combo. Do extensive on line research of the area, including local hiking blogs: use your specific keywords to drill down to the fine details of planning a hiking trip. Pour over maps of specific hiking trails and routes, and if there is a national park involved, be sure to read every trail & campground description carefully. Sketch out your hiking and travel itinerary in detail. Book your flights, accommodations, trail permits, car rental reservations, food access and everything else you'll need to pull off a fabulous hiking vacation. Then, and only then, are you free to turn your attention to your gear list, modified for the terrain and weather conditions. When the day comes to leave for your hiking vacation, you will go confidently in the direction of your dreams (quick, who said that? ), knowing that you have done your hiking homework. Sometimes it just feels good to give back, and the American Hiking Society makes it as easy as possible. Plus, you'll save money by offering your time and energy for trail building and maintenance in exchange for room and board. You can choose from easy, moderate and strenuous trips, along with various types of accommodations. Check out their volunteer hiking vacation options here. If you have more time than money plus abundant energy (twenty somethings, that's you! ), go the do it yourself route to spend freely from your energy & time accounts while being prudent financially. You will learn an incredible amount about yourself, and the area you hike in, by sleeping on the ground, exploring the trails, and enjoying frugal trail meals. 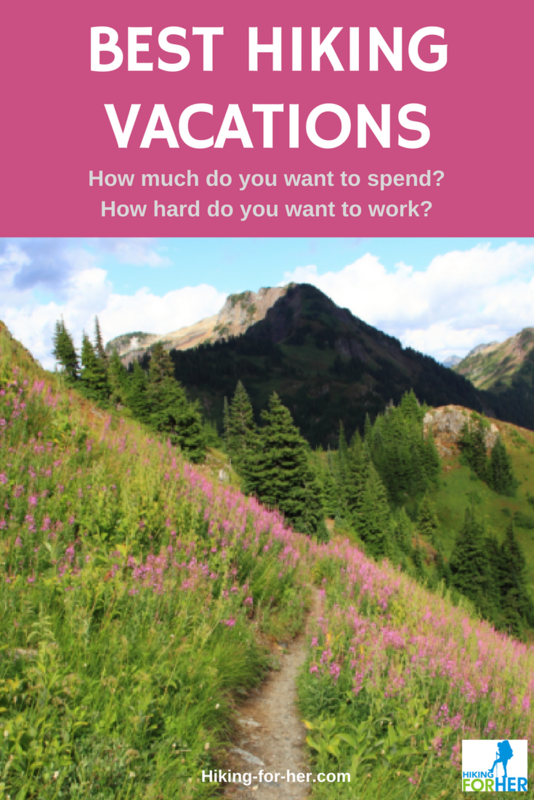 When you have more money than time and/or energy, as happens with full time job and family responsibilities, sign up for a "done for you" hiking trip that handles all of the details. You just show up and hike! And pay the credit card bills, of course. the knowledge & gear you'll need for comfort and safety along the trail. 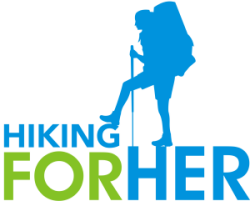 Use the search box at the top of this page to locate all of the free hiking information you need to plan your vacation! is the one you actually take! Life is fleeting, and so is the annual hiking weather window. However you get out there, be sure you've got some vivid hiking memories to savor when the cold winter closes in. More ideas for you: types of hiking to enjoy!